The town of Concord, Massachusetts figures prominently in the life of Amos Bronson Alcott. 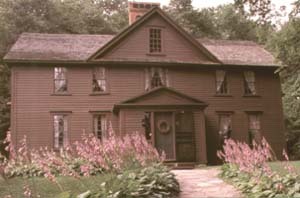 Alcott and his family first moved to Concord in 1840, mainly to be nearer to Ralph Waldo Emerson. Although the Alcotts left Concord to start Fruitlands in 1843, the family moved back in 1845--in time to catch Henry David Thoreau during his stay at Walden Pond. After several other moves, in October 1857 the Alcott family returned to Concord, and in May 1858 settled down at Orchard House. Orchard House, named after the apple orchard that once existed behind it, was the home of the Alcotts for many years. Here Bronson Alcott wrote Ralph Waldo Emerson (1865; published 1882), Tablets (1868), Concord Days (1872), and Table Talk (1877), as well as some poetry. Other famous Concord residents of Alcott's time included Nathaniel Hawthorne and W. Ellery Channing.